Choosing a best bathroom faucet isn't an easy task. Since it isn't only about the style. It is important to look beyond it and assess how it operates in reality. On top of that, faucets come in different kinds and from different brands. You need to pick something which can complement your bathroom and personalize your space. It doesn't matter whether you are replacing an old faucet or choosing it for a new home, there are some certain things which you need to know about it first. For example, as we have mentioned earlier, you aren't only setting the tone of your bathroom's personality. You need to know how it conducts when it comes to delivering water. You may think you have limitless options, but in reality, this isn't the case. When you ponder every aspect of it, such as technology, fishing style, quality, and price point, your options get significantly less. 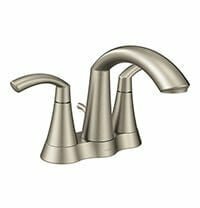 Therefore, it is imperative to focus on the highlights and features if you want to choose the best bathroom faucet for your home. All faucets aren't the same. The first and the most important thing you need to focus on the 'Installation Type'. It is particularly significant if you are replacing the old model, as you have to bring the same type, otherwise, it won't work. Are you looking for a wall-mounted or deck-mounted faucet? In case you don't comprehend these two terms, deck-mounted models sit on the deck or the counter. It has its own pros and cons. For instance, compared to the wall-mounted, it is easy to install, repair or replace. Also, it takes quite less space than the wall-mounted model. On the other hand, as the name suggests, wall-mounted faucets are installed on the wall. This one is more durable and lasts longer than deck-mounts. You should opt for the wall-mounted faucet if you have quite enough space in the bathroom. This is another kind which requires your attention. If some product is described as a single-hole product, it means it has a single handle controlling system. 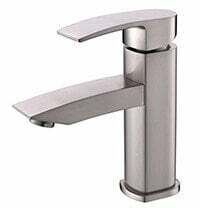 You can use this handle for both hot and cold water operation. The center-set model also looks like a bit same, but it has a spout and two-handles for different operations. Instead of handling the water temperature from a single handle, you use both handles for it. If you have a double-handle set in your bathroom and want to opt for the single-hole option, it is possible. You need to use an extra optional plate to cover the hole. The spread-fit faucet type is also known as the widespread faucet. The highlight of this product is it comes in different components. It is not packaged as one. You can adjust the width of its components according to your requirement and desire. For example, if you want to be a tad more creative with your faucet system, you can adjust the height and width between its levers on your own. This is particularly helpful if you are planning to install this model in the corner. You have the freedom. It is up to you how widely you want it installed. It also assists you in saving desire space in the bathroom. Once you decide the installation type, the next step is to consider finishing type. It is something which you should choose while keeping the style of your bathroom in mind. The finishing comes in four different kinds - Brushed, Bronze, Chrome, and Brass. Valve options can be considered as the installation type too. It controls the passage of the fluid. It facilitates in controlling the water temperature as well. It comes in three types - Ball Faucet, Disc Faucet, and Compression-Valve Faucet. In the ball faucet, there is a rounded ball that sits on the faucet spout. This feature is mostly in the single handle operation and it prevents leak better than the other two options. In the disc faucet, there is a cylindrical system that combines hot and cold water. It is durable and also considered as a new technology compared to ball model. In compression-valve faucet, there are two handles that control the temperature of water. When they compress the water, it shuts off. This is one of the oldest valve systems in the plumbing system that is still in use as a standard in many residence and office buildings. The above information is more than enough to choose the best bathroom faucet. It is important to keep the type and space of your bathroom in mind. This will give you a clear idea regarding the price you should opt for. In addition, there is one more factor that you should remember - Flow Rate. The average flow rate should stay between 1.5-2.5 gallons per minute. It shouldn't increase more than 3.0 GPM, as it won't only waste water, but the extra pressure can cause leakage issues too. If you are still confused regarding which faucet to choose for your bathroom. Below are the fifteen models that are top-rated in the market as well. 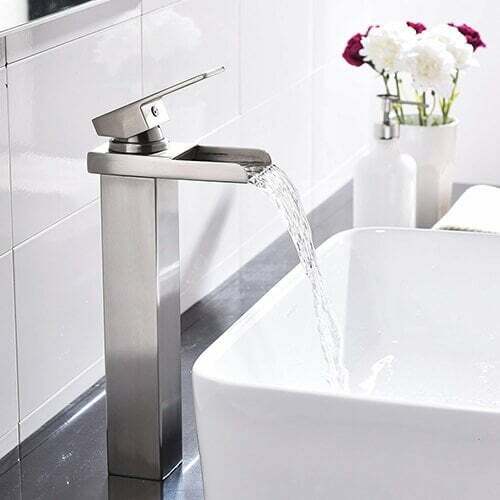 It doesn't matter whether you are building a new bathroom or replacing the fixtures, BWE Waterfall Spout Single Handle Bathroom Sink Faucet should definitely on the top of your list. It offers a terrific value! It is not only fantastic in its looks, but it is quite easy to install also. The BWE manufacturers present many important features in it. It is durable and long lasting. It has the potential to work 100% perfectly without any trouble. In addition, the things which we love about BWE waterfall is it gives clear and steady laminar stream. It is an immensely beautiful water presentation that steals the heart and turns your bathroom into a contemporary, lavish place. The pressure of water is geared towards water efficiency. It can be installed through 1 or 3 holes. It comes with a cover plate that is 6-inch wide. There are 5 different finishing colors. It is surface-mounted with single-handle placement. 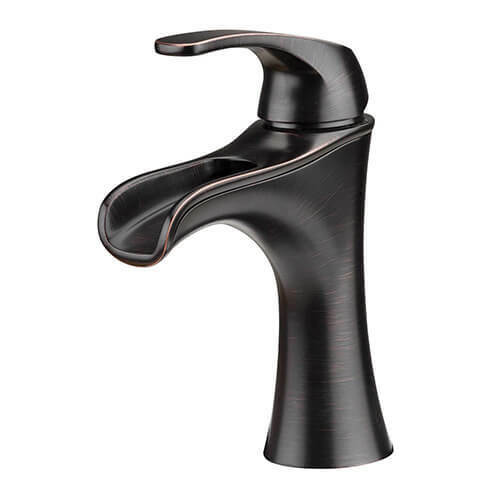 It is a very well-made faucet, with high quality and amazing design. If you are planning to install it in a contemporary space, you are right. It is much nicer than the expectations when it comes to the novelty. As its name suggests, it has two handles for convenient water adjustment. Though it looks stylish and extraordinary in appearance, you can install it rather comfortably. It is a 4-inch center set design. In order to make it the king in the industry, the manufacturers of Moen have presented a few more great features in it. For example, it gives 1.2 gallons per minute with the aerated stream. It isn't a lot and it isn't too much less as well. In a way, the company focused on giving the ideal GPM ratio which cannot only save water but also fulfill your everyday task. It is equipped with 2 lever handles for easy water temperature. The GPM ratio is ideal for everyday bathroom tasks. 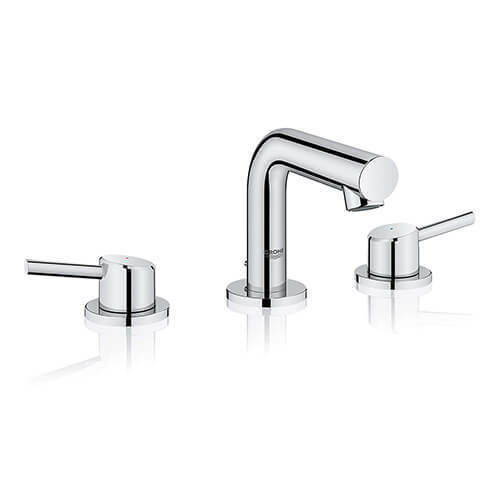 It is available in two distinct finishes - chrome finish & brushed nickel finish. It comes equipped with 1224 cartridge for durability. Moen's developers offer a limited lifetime warranty. We personally love this Pfister LFO42JDYY Jaida Single Control Model, but there is one issue in it which sometimes compel the consumers to flood it with 4-star ratings instead of 5-star - The Flow Rate. Though, it looks quite fine to us. It depends on the customers' needs too. But, many consumers feel that it doesn't deliver much water. The manufacturers focused more on conserving water and energy bills, but they decreased down the flow rate a bit more than usual. That's why it isn't usually preferred. if you are a person who desires a full volume of water, you won't find it attractive. Apart from this aspect, it is an awesome product. It appears that the manufacturers focused more on the design of this product, and they were quite successful in it too. You can notice its elegance defined by the subtle, sleek lines. Also, they tried their best to give it a traditional look. It can be mounted with or without the deck plate. It includes the seal drain for ease of use. It has an advanced ceramic disc valve technology. It is CEC water compliant. It is compatible with 1 or 3 hole installation. We love the finish of this product the most. The chrome finish of GROHE 20572001 Concetto 8 In. Widespread Faucet makes it feel like a polished glass. It appears that the GROHE company's main aim was to attract customers through its innovative look. Therefore, they gave so much attention to its overall appearance. The finish is in fact only one aspect. They also introduced StarLight for scratch and tarnish-resistant surface. The actual goal was to give it a lifelong expensive look, but we won't recommend scrubbing it with hard cloth or material such as scotch brite pad. Some consumers revealed this kind of pad scrubbing does scratch the surface. For that reason, it is pertinent to use some soft cloth for cleaning. Apart from this, it has the easiest installation system. You won't find too many components. The GROHE manufacturers made sure there are only a few installation steps. They attempted their best to introduce less complicated parts to reduce installation time. Even if it is your time, you can install it without any trouble and within a few minutes. The SilkMove of GROHE gives a lifetime of smooth operation. It offers EcoJoy Technology for less water and perfect flow. The SilkMove also assists in precise handling. It installs with ease and speed due to QuickFix Technology. Its package includes the drain assembly. We totally love its design. It is just the right size with exceptional quality. 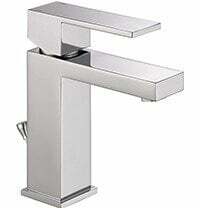 Unlike many other taps, which look like the cheap plastic imitation, you can notice its great quality straight away. The material is solid and it feels substantial especially when we assess it according to the price point. The KINGO HOME developers gave it LifeShine brushed nickel finish too which also facilitates in giving it an expensive look. We have personally seen this model; therefore we have a clear idea regarding how it works. 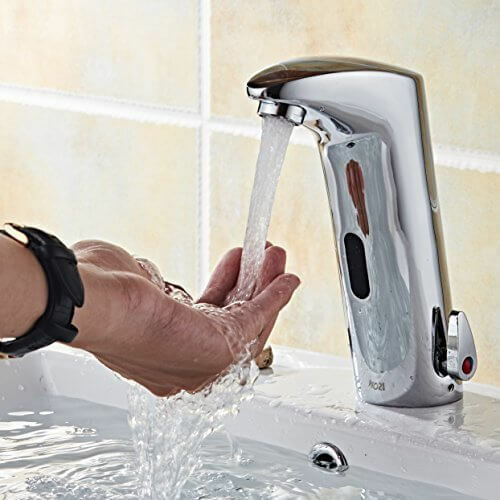 The water mode of this single handle tall vessel tap is the stream, which is common, but the thing that makes it special is it is 100% pressure tested. The professional manufacturers of this company tried to prevent leakage issue even in the extra pressure. 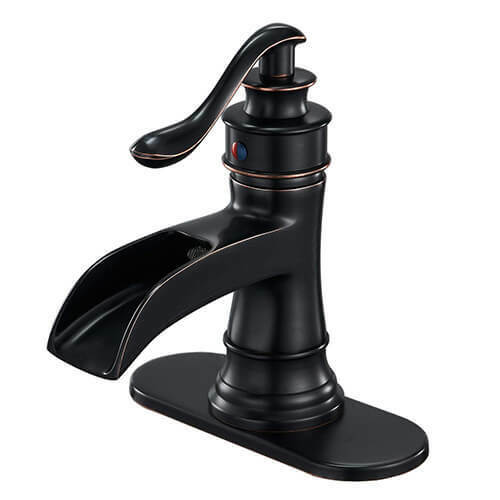 If you are a person who deals with the leakage issues in the faucet time and time again, you should definitely opt for this one. Water pressure recommendation: 0.5 - 1.0. It requires only one hole for installation. 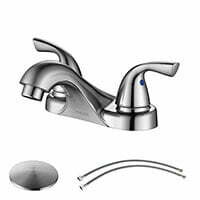 Its package contains the sink faucet, hot & cold water hoses, and mounting hardware. It is 100% pressure tested. The ceramic disc valves ensures durable performance. 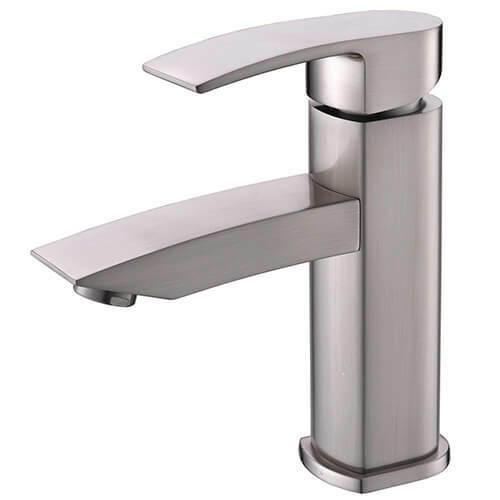 Everything is super perfect about Hotis Widespread Single Handle Single Lever Faucet except one thing. The word Hotis is written on top of the faucet. The manufacturers should have mentioned it in the description, but there isn't any sign of it. In fact, it isn't shown and mentioned in the picture too. We believe this is a deceptive act. It can facilitate in selling the product and it will damage the company's reputation in the long term. However, apart from this single flaw, everything is quite right and attractive about this faucet. For example, it has a solid brass body construction with an overall height of 7.09". In addition, this faucet gives single handle operation. You can easily adjust the volume and temperature of the water through it. Lastly, and most importantly, hot and cold supply lines are included in the package. This is a big bonus for those who don't want to spend an extra amount of money on the supply lines. However, there is one downside as well. The package doesn't include the pop-up drain. The height is 7.09", but the spout height is 4.13". The HOTIS HOME Company gives a 90-day money back guarantee on it. It gives 1.8 GPM water flow rate for daily use. It is a one hole installation. It has a solid brass body construction with a brushed nickel finish. If there is one faucet which is designed for performance, it is PARLOW Two-Handle Bathroom Sink Faucet. It has an utterly great wide-spread design that gives you a different user experience. 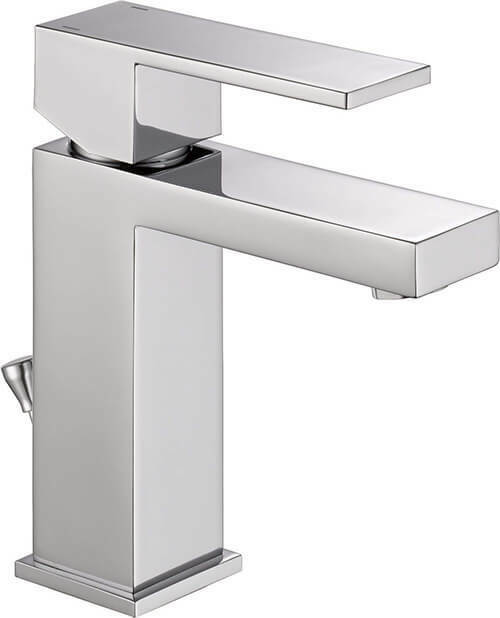 It is indeed tough to find this kind of wide-spread design in the market, as most models are either in enclosed position or focus on the height of the tap. It is certified to cUPC and NSF 61, Lead-Free. For that reason, it can be considered safe too according to the industries' professional standards. We have reviewed many other expensive faucets too, but it is a lot better than them. It not only challenges their price point but also looks much better. It is 100% classy. It has a brushed nickel finish. It comes with 2 water supply hoses. The package includes pop-up drain assembly too. It requires three number of holes for installation. It is a surface-mounted masterpiece. 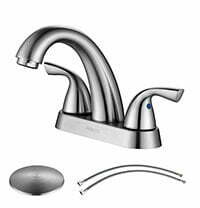 Don't go on the image of Yodel Single Handle Waterfall Bathroom Sink Faucet on the website. It is bigger than it looks on the site, 3-4 times bigger indeed. But, this is something we actually love. The size of this Yodel product makes it look pretty high end. There is one thing though which you should keep in mind before buying this product. It demands a larger hole size than usual. Unlike other faucets, it won't fit in an average size hole. You need a drill to fit it inside the sink. If you can't do that or if your sink can't afford to have a bigger hole, you should avoid it. In our opinion, it is designed for larger size bathrooms. Apart from this, the Yodel Faucet Company have tested this product's cartridge system too. It survived 500,000 times open and closed tests. Therefore, you can trust its durability. It is for the single hole sink only. Don't try to fit it in the 3-hole sink. High-level engineering offers great control precision. It will be bigger than your expectation and suits the larger size bathrooms. Its special design cancels the noise to the maximum extent. The Yodel Faucet Company gives Lifetime warranty against leaks. Do you like tall waterfall like faucets? 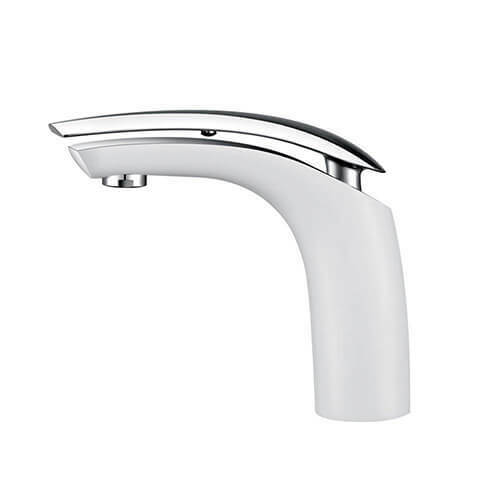 BWE Company is offering one of the best tall waterfall single handle faucets. It is an absolutely beautiful and gorgeous model that steals lots of eyes and praises. There are some conflicting reviews regarding its content package too, as some consumers think it comes without the drain stopper. But, in reality, it comes with the drain stopper and many consumers confirm it too. If you have any concern regarding this aspect, you can contact their customer support service. 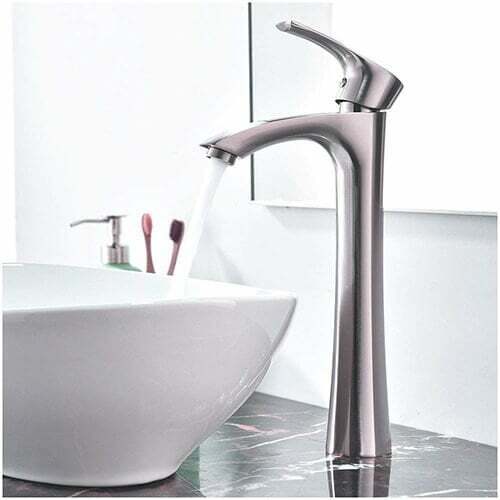 Before you choose this Aquafaucet Tall Waterfall Single Handle Faucet, you should know a few more things about it. It is a deck-mounted model with the ceramic disc cartridge system. The BWE Company especially mentions one thing about it which we don't see it often. This model has been tested 500,000 times in opening and closing. This is more than enough to count on its durability. Package content: 1 x bathroom faucet and 2 x hot and cold flexible hoses. It has a chrome finish. The length of the hose is 20 inches. 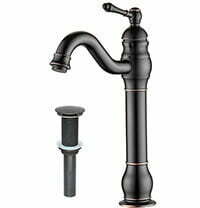 It is tough to describe the features of MYHB 360o Swivel Oil Rubbed Bathroom Sink Faucet. It has everything you need. From its looks to functionality, it exceeds the expectations on a massive scale. The first noticeable think about this product is the height. The faucet height is 12.6" while the spout height is around 9". The extraordinary design, with the brushed bronze finish, gives your bathroom a touch of vintage style too. 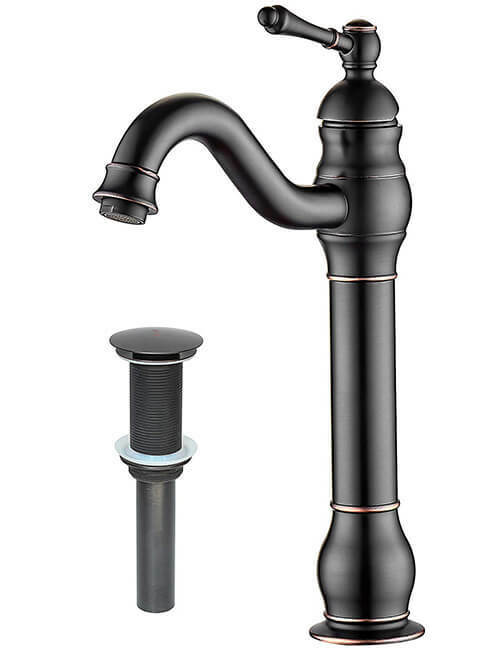 The unique thing about MYHB 360o Swivel Oil Rubbed Bathroom Sink Faucet is the 'Adjustable Height'. You can adjust the height rather comfortably by disassembling the middle tube. This is something which we don't often see in the other products. In addition, this feature facilitates those too who need something for a smaller space. Furthermore, in case you are thinking what exactly is 360o Swivel is, it actually allows you to adjust the position of the spout. It makes it more functional. It is a single hole bathroom faucet, and it is easy to install. The swivel function allows you to adjust its position. It has a built-in high standard cartridge system. It is cUPC certified with never leak guarantee. It comes with 2 hot/cold water supply hoses too. The installation procedure is so easy. Even a novice can install it within a few minutes. It comes with many features, but we love its no-leakage feature the most. It has a nice tight seal that doesn't leak. It can even survive the extra pressure of water comfortably. Moreover, it is a heavy duty unit. This thing ensures it will be a lifelong friend too. You don't have to replace it over and over again. Other than that, according to its developers, it is a slightly angled faucet, which means it makes less splash. If you are tired of water splash in the bathroom sink, this is definitely for you. 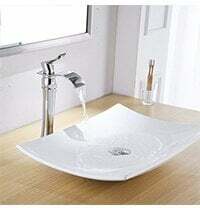 It is perfect for both deep sink and shallow sink. Furthermore, there is another feature which makes it grab the winner's title in the market. It matches and fits perfectly on different materials of the sink. It doesn't matter whether it is glass, porcelain, stone, or marble. It comes with a metal washer and rubber washer. It is a tall faucet with the spout height of 11". The design of this matches different materials of the sink. It gives smooth stream water flow. It resists tarnish and corrosion from daily use. 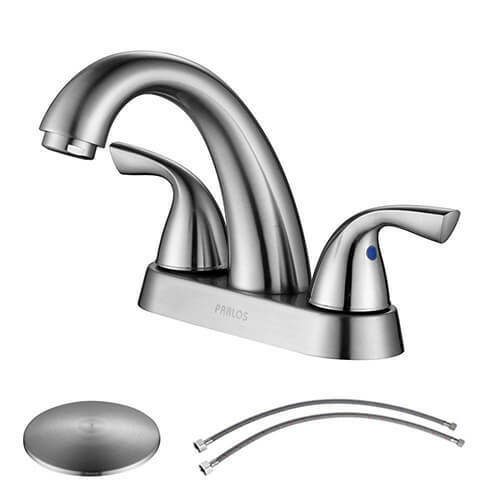 If you are specifically looking for a 2-handle bathroom sink faucet, you won't get anything better than the PARLOS brand. It offers 2-handle bathroom faucet with seal drain assembly and supply hoses. In a way, they tried their best to offer the complete package to their customers. You don't have to visit the hardware store for buying additional components. The thing which I loved the most about this product is it is easy to install. You don't need any professional-level plumbing skills. In case you are pondering regarding its price and feeling reluctant to purchase it, let me tell you it is made of solid material, which means it is a long-term investment. It doesn't look like a cheap model. Even if you are opting for it for a contemporary bathroom, it will compliment it due to its quality, flattering design. 2-lever handle for easy water adjustments. It comes with pop up drain. It requires 3 holes. 1 each for the hot and cold valve, and 1 for the center. The faucet looks great and contemporary. It is certified to cUPC and NSF 61. The first thing you will notice about Delta Modern Single-Handle Bathroom Faucet is it is quite heavy. But, this feature makes it look like a quality product. It is not only heavy but also have an impressive look. Due to its shiny finish, it appears quite expensive. We agree, there are some other taps like it in the industry, but they aren't offering the features like this Delta product. For instance, the dimensions of this product make it rise above its competitors. It offers 5-3/8 spout height and 6-1/16 inches spout length, which is industries best. It is hard to find this feature in any other faucet. There is one more thing which we should mention here must. Do you know it is WaterSense Labeled? It uses 20% less water than the industry standard. This isn't only great for the government, but it also assists you in saving money without compromising the quality. This faucet comes with a pop up drain assembly with a matching finish. It gives different installation options. It saves you money in the long run, because of WaterSense label. The Company offers lifetime limited warranty. 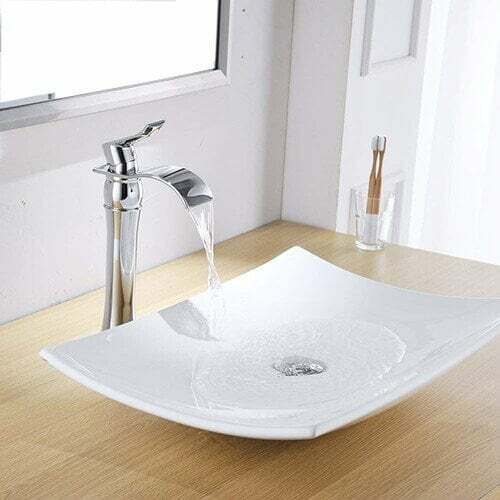 Due to its appearance and description, people think it demands some different kind of sink. But, in reality, it can work with a regular sink. Before we shed light on its specific and special features, first it is imperative to mention one thing here. Most people don't perceive which hose goes to the hot water side. If you are also in this situation and installing this faucet on your own, all you need is to look for the red mark. The hose with the red mark goes to hot side while the other one towards the cold. Now, the real question is what makes this faucet great in the market? Well, it is the 'Automatic Sensor'. And, for that reason, it is expensive too compared to many other faucets in our list. It offers the touch-free use and prevents cross infection as well. Though this concept is already in the market, we have mostly seen it in the shopping malls and etc. But, now it is possible to have electronic automatic sensor touchless faucet in your own home too. It is a nickel brushed finish with solid brass construction. The HHOOMMEE Company gives a lifetime warranty. There is a 30-day free replacement guarantee. Detailed instructions with diagram are included for easy installation. It is a one hole installation type. Want safe and healthy water with modern design? 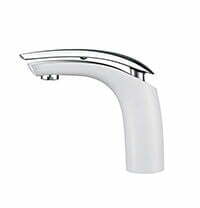 Place your hands on DESFAU Bathroom Faucets Chrome Single Handle. When it comes to both modernity and functionality, it is tough to beat this one for its competitors. It is the best in both aspects. Apart from introducing modern curves in it, the DESFAU developers made it according to the LEAD-FREE standard. It was their aim to give no lead releasing product in the market so that the entire family stays safe. Among all these products, it would be correct to say that it facilitates in producing the safest water. The material of this product is also tip-top. It ensures durability and stability in the long run. It is a high purity BRASS construction. It controls hot and cold water flow efficiently. 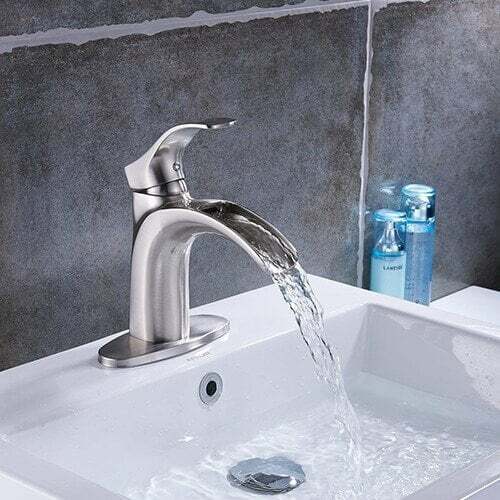 It is a cUPC and Certified Lead-Free standard faucet. It has an excellent quality of plating layers. DESFAU developers introduced Sedal ceramic valve in it. It complies to the strictest water saving standard. 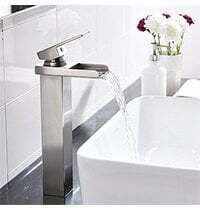 All of these above faucets have a classy and innovative style and they come with a wealth of options too. Before buying them, you need to decide where they are going. Do they directly install on the sink deck or on the wall? 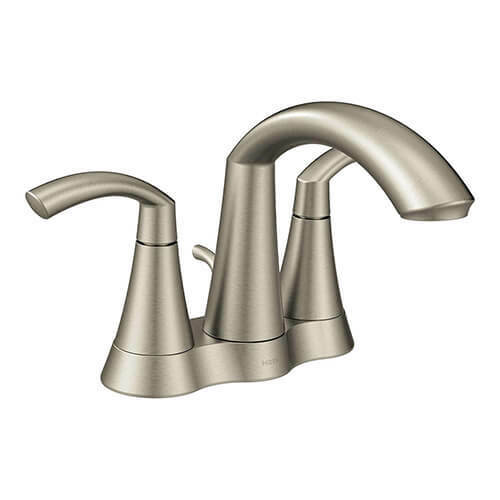 Pondering about this question only will assist you in choosing the best bathroom faucet in the above list.